Deutsche Lufthansa AG (IATA: LH; ICAO: DLH) tsejoang Lufthansa ke kgolo ka go fetisisa Jeremane lifofane, ga go kopantswe le ka tiasa yona yona, le e lifofane kgolo ka go fetisisa Europe, ka bobeli ya ka dipehelo tša bapalami ba nkang etsoa le likepe bogolo. It operates services to 18 domestic destinations and 197 international destinations in 78 countries across Afrika, Amerika, Asia le Europe, sebelisa likepe tse baetsi ba lifofane go feta 260. 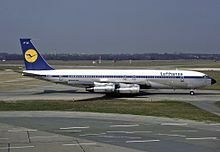 Lufthansa ke e mong oa litho tše hlano tša Star Alliance, ea li hulang pele sefofane selekane, thehoa ka 1997. Ntle go moo Airlines tsa lona tsa baeti Austria Airlines, Switzerland International Air Lines, le Eurowings go akarelletsa Germanwings. Kopantswe le ka tiasa yona ba eona, sehlopha na holim baetsi ba lifofane 615, etsa hore ho e' ngoe ea kgolo ka go fetisisa fleets baeti lifofane lefatšeng. Ka 2014, sehlopha etsoa tse ka godimo go nka bapalami ba limilione tse 106. Lufthansa Lockheed L-1049G Super Constellation operating a transatlantic scheduled services from Hamburg to Montreal and Chicago in May 1956. Lufthansa operated the high-capacity Airbus A300-600 ondomestic and European routes until 2009. The image shows an aircraft of that type on final approach at Frankfurt Airport in 2003. ↑ Dinah Deckstein (9 May 2012). "Restructuring Plans Further Along Than Thought for German Airline Lufthansa". Spiegel Online. Retrieved 5 July 2013. ↑ "Lufthansa Group - Route Map". Lufthansa.com. 2007-02-16. Retrieved 2013-10-11. ↑ "Lufthansa Annual Report 2012" (PDF). Retrieved 2015-07-13. ↑ Kingsley-Jones, Max. "6,000 and counting for Boeing’s popular little twinjet." Flight International, Reed Business Information, April 22, 2009. Retrieved: April 22, 2009. Letlakala le fetotšwe la mafelelo ka 11:24, 11 Phato 2016.